$39 includes dinner, tax, gratuity, and a glass of house wine or beer or a non-alcoholic beverage excluding specialty coffee drinks. Dinner must be pre-paid to Waterfront Village. Happy hour prices of $5 for house wines and beers as well as full bar service are available a la carte and may be paid at the restaurant by cash or credit card with separate checks provided for alcoholic beverages and specialty coffee drinks only. Regular menu service is not available, and neither menu substitutions nor modifications are possible for this special event. Please contact the Village at events@dcwaterfrontvillage.org with any concerns about food allergies prior to confirming your participation. Dining in the Edwardian era was an elegant multi-course event, nowhere more so than the grand British "palace" hotels of the era, notably the Ritz and the Savoy, and their ocean-going counterpart, the luxury liner. 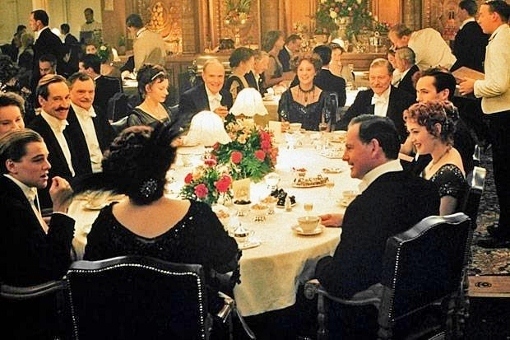 Dinner on the Titanic is forever identified with the tragic sinking of the ship on the night of April 14/15, as the ship had it's fateful collision just hours after many people had finished dining.